Image caption The data from wristbands could save lives, but are there risks associated with the technology? Data from personal bio-monitoring devices such as fitbands and smart watches, when combined with genetic information, could be a powerful tool in medical research. But what will all this tell us about ourselves. Science writer Kat Arney finds out. Thanks to advances in DNA sequencing technology, researchers around the world are now faced with a deluge of genetic data gathered from hundreds of thousands of people. Despite the headlines claiming to have found "genes for" everything from alcoholism to Alzheimer's disease, we actually know relatively little about how the strings of DNA letters that make up our genome influence our bodies and brains, either in sickness or in health. The challenge now is to marry up all this genetic data with living, breathing reality, figuring out how variations in each person's genome contribute to their health and wellbeing. At Stanford University in California, Stephen Montgomery and his team are using the latest DNA-reading technology and sophisticated algorithms to work out how tiny variations across our genomes affect when and where genes are turned on. These aren't big changes, but subtle differences that dial gene activity up or down just a little bit. And those small changes can make all the difference. As Stephen tells me, seemingly minor variations in our DNA code can have a big impact on our health and well-being. "For instance, someone might be able to fight off an infection slightly better than someone else. Or someone responds to a drug better than someone else," he explains. "We want to be able to describe those benefits so that they might be able to help us understand what makes each of us unique, but also to understand how we might use that to tailor any particular treatments for any individual." To do this properly, we need more data - not just about each person's individual genetic makeup, but information about how their body is changing over time and responding to their environment, diet and lifestyle. The biggest challenge here is how to gather this information in an effective and relatively hassle-free way. Nobody wants to be dragged into the doctor's surgery every month, week or day for a check-up, even if it might help protect their health in the long term. Luckily, technology seems to have provided us with a solution. The recent rise of the "measured self" movement, dominated mainly by wearers of personal bio-monitoring devices such as fitbands and smart watches, could provide the vital statistics that this new generation of geneticists need. At the moment, these devices are relatively simple. 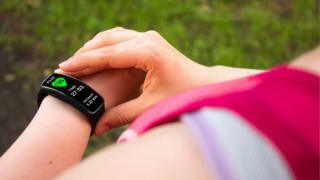 The cheapest are basic movement trackers, while more expensive models monitor heart rate. But developers are busy working on wearable technology to track blood pressure, blood sugar levels and all sorts of other parameters. They may be giving geeks everywhere a whole new set of graphs to play with, but combined with genetic information, the data from these wristbands could prove life-saving. "We've never had this kind of data," Dr Montgomery tells me. "We don't know what the genetic effects are on this data over time. Even when you go to the doctor you're just getting a readout of this one snapshot in time." And for people whose blood pressure rises at the mere mention of medical matters, that single reading might not be a reflection of their day-to-day state. There's also an added dimension of complexity: time. Just as you don't have the same photo in your passport when you' re 40, 60 or 80 as you did when you were 20, we shouldn't think of analysing someone's genome as a one-off snapshot. According to Dr Montgomery: "We know that there are a lot of changes as people age and it' s different for men and women, from childhood to puberty to menopause. So as well as being able to survey your blood pressure and so on over time, you may get a very detailed understanding of the behaviour of your genes at any point in time and that will inform you to a much higher degree about your overall health and well-being." Combining the power of modern genetic analysis with bio-monitoring could be a potentially life-saving way to spot the earliest signs of illnesses such as diabetes, heart disease and cancer. But like Michael Douglas in the film Wall Street, standing on a beach shouting into his ridiculously oversized mobile phone, bio-monitoring devices and smartwatches are still toys for the few, rather than tools for the many. Stephen's solution is to get them into (or rather, onto) as many hands as possible. "I think [the manufacturers] need to send these devices all over the world - there's a lot of opportunity!" But, as he tells me, although we're getting really good at DNA sequencing, we still have very little idea about how variations in our genes affect how our bodies are built or how they work, either in sickness or in health. Collecting information from fitband-type devices over time as people are just living their lives, combined with regular genetic analysis, will allows us to gradually unpick what's going on. And - more importantly - it could enable doctors to make powerful predictions about health risks. As Dr Montgomery explains, "It would be much better if there were devices that gave people warnings of things to look for, instead of being too late when you're already in the hospital with a heart attack." There are big potential benefits from gathering this kind of information, but also risks. Technology is changing much faster than the slow-grinding gears of legislation and concerns have been raised about data privacy and protection. At the moment, commercial organisations that sell either genetic analysis or fitbands have reassured their customers that their data is safe in their hands, but there's no guarantee that this will continue to be the case in future. The other big question is whether all this extra knowledge will really make a difference, because increasing health and wellbeing in the population isn't just a scientific problem, it's a people problem. We already know a lot of what the bad stuff is in our lifestyles, but people still smoke tobacco, drink too much booze and swerve the salad bar. Kat Arney is the author of Herding Hemingway's Cats: Understanding how our genes work. iWonder: Can exercise train my brain?